This year we will be starting with a bang, with March marking the official 100th birthday for Canberra. To help celebrate the big day on Tuesday March 12, we are offering a walking 'marathon' of all three parts of the popular Old Acton Series. Be amazed at Acton captured in old photos with Allen Mawer as he peers back into the early history of the area, comparing carefully selected historic images with new vistas. Join us for one - or for all of these walks - with time to sample the local restaurants and cafes in between. 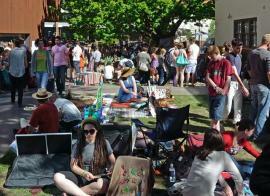 On Saturday March 16, NewActon will come alive for the Art, Not Apart one day multi-arts festival. This will be an amazing day of musicians, poets, painters, sculptors, dancers, street artists, filmmakers, clothing designers, and weavers from all walks of life. In conjunction with the organisers, we will be running three behind-the-scenes tours. There will be plenty of sites and sounds, as well as refreshments to sample throughout the day. Acton Walkways holds social lunchtime walks on Wednesdays from 12pm-1pm. These walks will begin again on April 10. We take different routes each week, exploring scenery around the Acton Peninsula, Sullivans Creek and the many trails of the ANU Campus. Meeting at The Street Theatre, corner of Childers St. & University Ave.